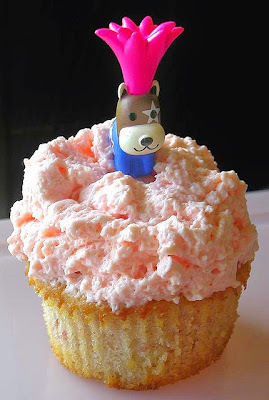 raging yoghurt cupcake, originally uploaded by chotda. Here's another adorable photo from our Flickr group, this time posted by Chotda. I just love the look of that fluffy, whipped yogurt frosting. I'm going to ask her for the recipe. ingredients: 1 packet unflavoured gelatin, sprinkled into 4 tsp cold water left to sit for a few minutes, then heated until dissolved. whip these ingredients together until thickened but not stiff with an electric mixer. put the mixer on 'high' then slowly drizzle the melted gelatin into the yogurt mix until well incorporated. transfer into one of those ziplock type storage bags and refrigerate. it will set fairly quickly, maybe ten minutes. cut a small corner off of one end of the bag and squeeze the whipped yogurt onto the top of a cooled cupcake. as the yogurt is gelatinized (or carageenized if you use vegetarian gelatin), it should keep its shape without refrigeration for awhile, but i'm not sure how long. the squeezing out of the bag makes it all funky, but if you prefer something smoother, you can just use a palette knife to frost it on, but it will still be sort of lumpy. i think that is afro ken on top. Yum, that frosting recipe sounds great! I can't wait to try it this weekend. And I can see changing the yoghurt type to suit the cupcake it is paired with.